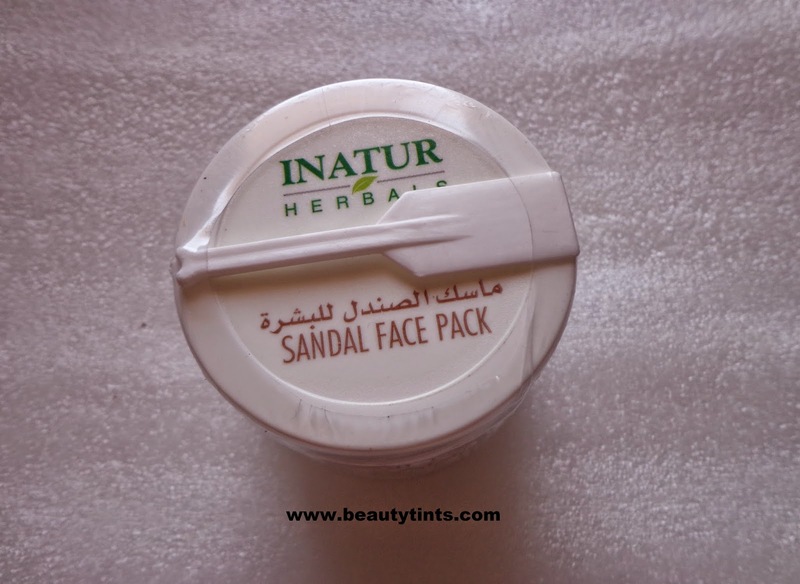 Sriz Beauty Blog: Inatur Herbals Sandal Face Pack Review!!! 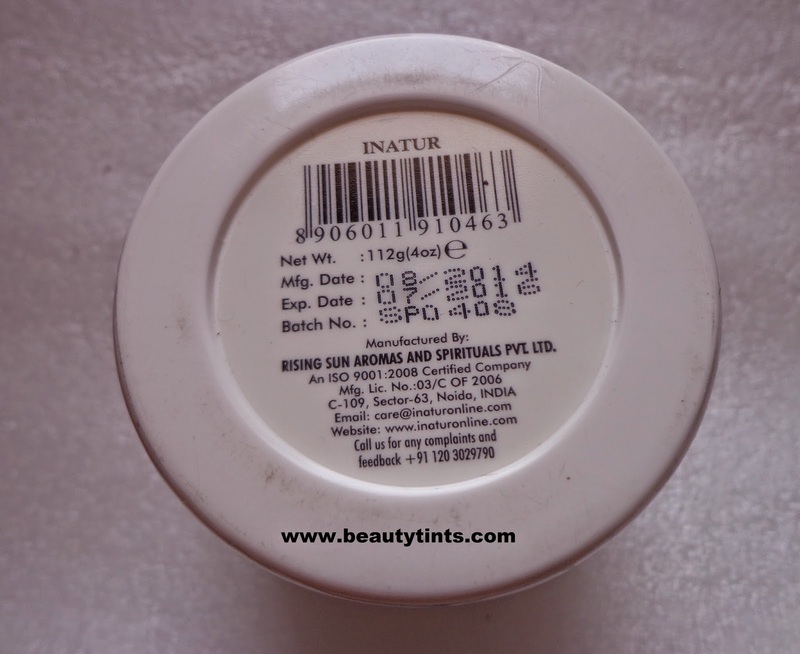 Today I am reviewing Inatur Herbals Sandal Face Pack,which is one of the products from the set of products I showed here.This sandal face pack is meant especially for controlling Blemishes and Pigmentation,which are my major skin concerns right now.I have used this for 5-6 times for now and I am completely satisfied with the result it gave. Packaging : It comes in a cute tub packaging with a screw cap and a spatula. 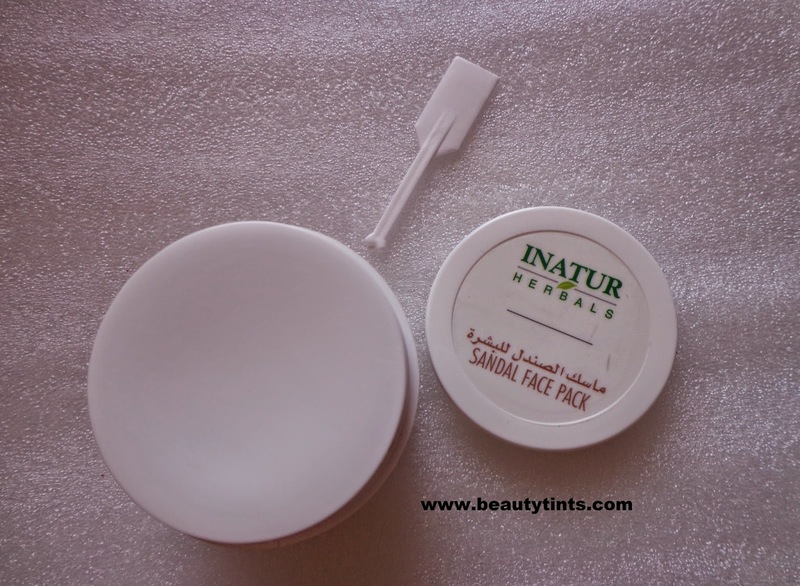 Inatur’s sandal pack is a perfect blend of skin-soothing, calming, rejuvenating and anti-ageing herbs, which effectively keep your facial skin younger looking and vibrant for years to follow. It removes scarring and unveils a freshened and glowing complexion.It contains Indian Sandal- that is a potent anti-oxidant, antimicrobial, anti-inflammatory and anti-ageing ingredient that helps to remove dead cells and is useful in most skin disorders, Turmeric- an excellent exfoliating agent, defeats signs of ageing, reduces wrinkles, gives a blemish-free and fair skin, Liquorice- prevents tan and brings fairness, Saffron- removes tan, tones the skin, gets rid of acne, gives a luminous complexion, Vertiver- a regenerative ingredient for tired and ageing skin.It can be used every day. 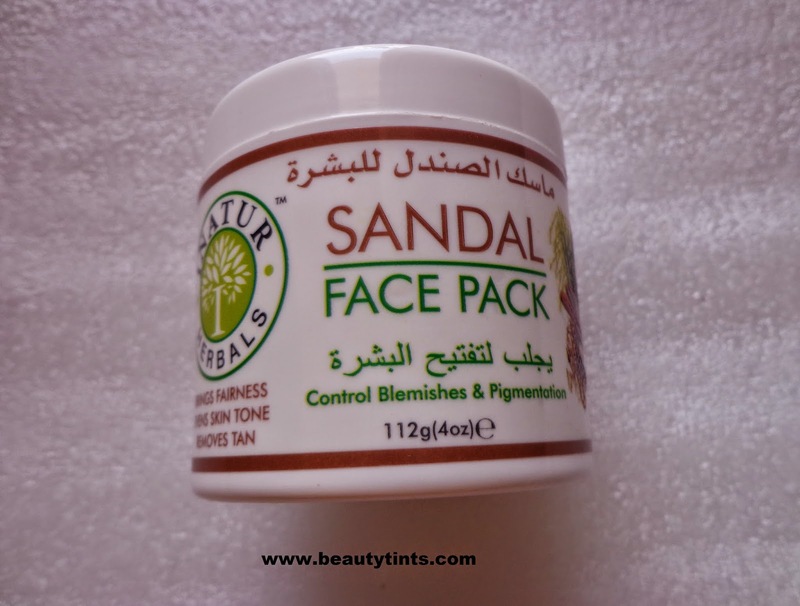 Directions : Apply a thick layer on clean face,wash off when dry for clear and fair skin.Daily application is recommended.Applicator attached for smooth application. 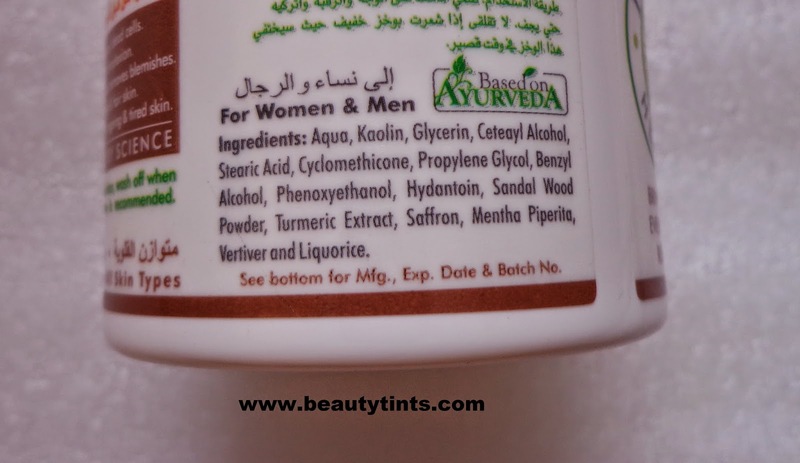 Ingredients : Aqua, Kaolin,Glycerin,Ceteayl Alcohol,Stearic acid,Cyclomethicone,Propylene glycol,Benzyl Alcohol,Phenoxy ethanol,Hydantoin,Sandal wood powder,Turmeric extract,Saffron,Mentha piperita,Vetiver and Liquorice. 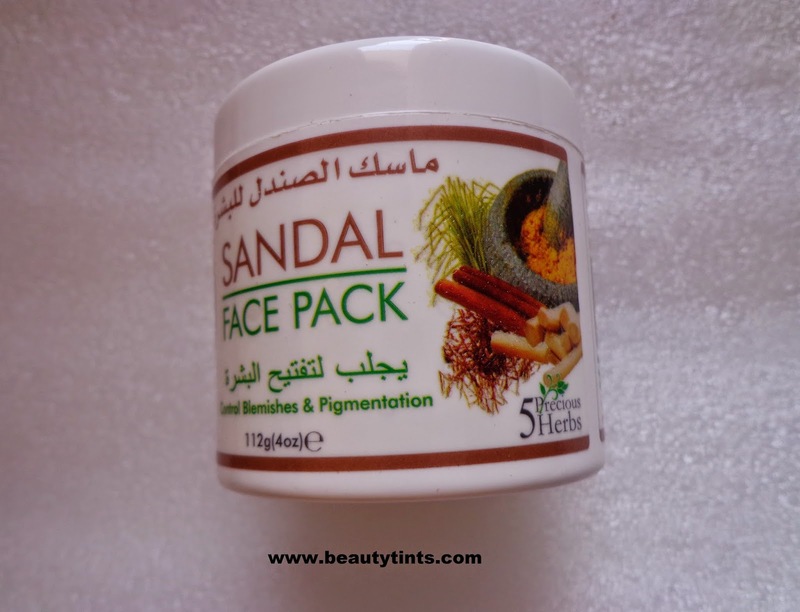 My View On the Product : This face pack smells of divine sandalwood and is very soothing and relaxing.It is a creamy pack which spreads easily on the face and takes around 15-20 mins to get completely dried.Immediately after application,a mild tingling sensation occurs and with in a minute it subsides.It suits almost all skin types, extreme dry skin people may feel it a bit drying in winters.It gives instantly radiance to the skin making it clean and bright.It acts as a good tan remover,as it helps in removing tan to a great extent.This pack is especially good during summers as it helps in giving a cooling sensation and helps in reducing the burning sensation.It is enriched with the goodness of Sandal wood along with Turmeric,saffron,Vetiver,Mentha and liquorice.It is free from parabens and other harmful chemicals.Though it is a tub packaging,it comes with a spatula,which makes it easier for us to apply as well as good in terms of hygiene.It can be used every day.The brightening effect stays for 2-3 days and so it is best suitable to use before attending a party or a function. 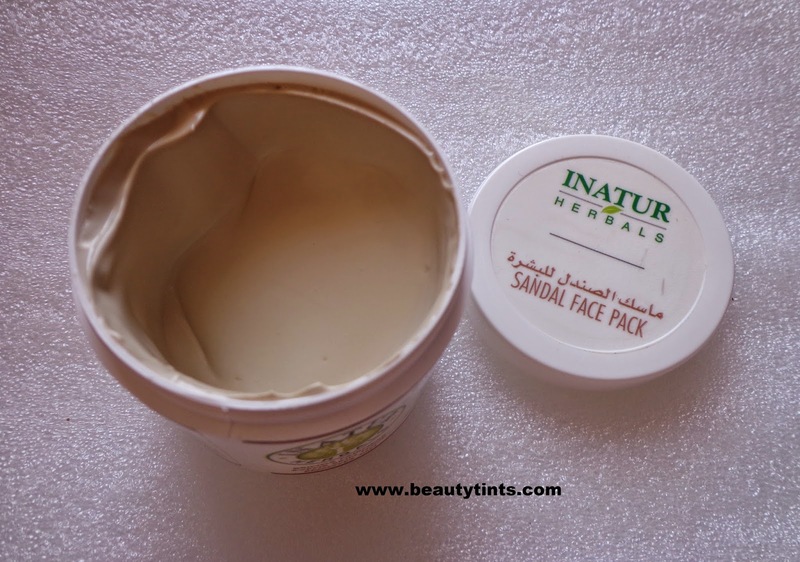 Final Conclusion about Inatur Herbals Sandal Face Pack : Those who are looking for a multi purpose pack which helps in making skin clean,radiant as well as which helps in removing tan should try this pack for sure.